Celkon is among the faster growing domestic manufacturers. The growth of this brand can be judged by how common a name it has become. This is an outcome of aggressive marketing strategy(Celkon had Virat Kohli star in their ads, remember?) coupled with deliverance of quality products at competitive prices. The company launched an array of products in the first half of 2013, including the very popular Signature HD A119Q, the 4.7 incher, A62, and a host of other entry to mid level devices. 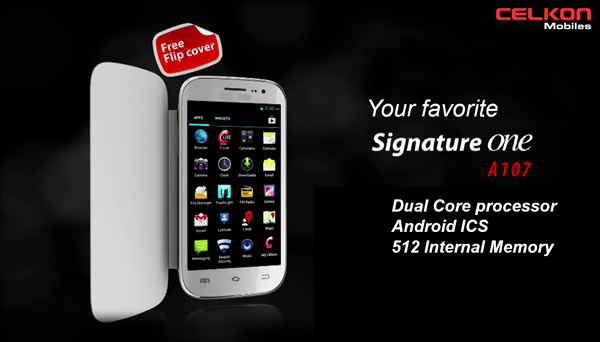 This post would be focusing on their latest launch, the A107+, which is a dual core device with a 5 inch screen. Like most other devices in the range, the A107+ too, comes with a standard 8MP unit at the rear. However, the expected price of this device is said to be 7,000 INR which makes it more worthy than the others. You can expect decent quality pictures from this unit. However, you need to keep in mind that there is a gap in terms of quality when it comes to, say, an 8MP from Celkon and an 8MP from Sony or Samsung. If you understand this, you will not be disappointed with the outcome. On the front of the device, there’s a 1.3MP shooter which should come in handy during video calls. Most manufacturers have come up to 1.3MP front cameras from VGA units, so the A107+ is no exception. Storage is a standard 4GB which can be expanded up to 32GB via means of an SD card. This is probably where the device will catch most eyeballs’ attention. The phone comes with a 1GHz dual core processor, which is indeed very impressive for a device with (an expected) price of 7,000 INR. You can expect the dual core processor to take you through most tasks without hassles. However, the lack of sufficient RAM might be a cause of concern. The phone comes with 512MB RAM, which might be seen as the only gripe on this otherwise feature packed device. 1GB would’ve been perfect; but that would be asking for too much from Celkon. The dual core device would come powered by a 2100mAh battery, which is above average given the expected price of the device. You can expect the phone to give you one whole day of backup without many hassles. This impressive device from Celkon would come with a 5 inch screen, packing a WVGA resolution of 800×480 pixels. Although the pixel density wouldn’t be as high as some other phones, it should be enough to carry out daily tasks such as email, chat, web browsing, etc. Readers can take the Samsung Galaxy Grand as reference. The display properties of these two devices are identical. The device will come with dual SIM functionality. Also, noteworthy is the fact that there will be Android v4.2.2 out of the box, which is something very impressive for a device of this calibre. There are more than a handful other dual core devices in the market today. Most come from brands like Micromax, Lava, etc. while some come from International manufacturers such as Samsung. However, the A107+ seems to offer the highest bang-for-your-buck. Devices from other manufacturers which can be compared to the A107+: Lava 3G 356, Lava 3G 402, XOLO A500S, Videocon A52 among other phones. Overall, the device does impress with the specs sheet it carries. However, price will play an important role. There is no word from the company yet, but speculations say that the device could be priced anywhere between 6-8,000 INR. If that is the case, the device would be one to look out for. While the Canvas 2 still sells, it is priced quite a notch higher, which might play in Celkon’s favour. And, as usual, we do expect a fair deal of aggressive marketing from Celkon towards the A107+ too. The fact that Celkon are giving a free flip cover might help them garner additional attention, we think. UPDATE: The device has been priced at 7,299 INR, which is about what we expected. Please report the same, and get it checked at the service center.